Epoxy Flooring Styles- What’s the best option? When it comes to increasing the value of your home, you have many options in upgrades that can get performed. However, not all the options are worth the effort or the expense, returning little to no positive changes. One of the frequently chosen upgrades is new flooring options, as many builders use cheaper materials during construction. And while a set of new floorboards or carpet look lovely, they might not add as much to your house as you expected. Traditional flooring options also restrict how creativity you can enjoy. At most, you can hope to pay a lot more for different colors or more expensive materials, but it’s probably not worth it. Instead, more homeowners are turning to epoxy flooring for their ease of installation and comparable pricing. Below are some of the many styles that Dallas Epoxy Pros can install for your home today. Surprisingly, there is a substantial difference between epoxy flooring, and merely coating your floors. Believe it or not, that difference comes down to only two millimeters. Epoxy floors remain thicker, creating actual flooring from epoxy layer buildups that form a denser, more impact-resistant surface. Resin floor coatings, on the other hand, is thinner, and typically goes over existing damaged concrete surfaces. You may enjoy the way that a resin finish looks, but you don’t necessarily want a more industrial appearance inside of your home. When you prefer thinner flooring materials, a coating application might be the best option for your tastes. If you value style over function, then you may not need the extra layering that traditional epoxy floors utilize. When you need to upgrade flooring on a budget, this may be the best solution for your home. Epoxy Flooring The thicker application of resin becomes your new flooring as it hardens into a denser block of epoxy. While your traditional use of epoxy is in industrial settings or buildings that store chemicals, but you don’t have to have a home that looks like a warehouse. One of the benefits of upgrading to epoxy flooring is that in many instances, it can get installed directly on top of your existing materials. If you have old hardwood that you don’t want to pay to remove, your installation team might simply coat directly over it. Tile and grout pose a different set of problems, however, and you’re likely better off removing them rather than trying to take shortcuts. Not only are some tiles too slick for the resin to adhere, but it’s incredibly common for grout to become visible, “bleeding” through the epoxy. Whether you remove the original floors or not, epoxy remains one of the fastest materials to install. The process will still require several days, but it’s among the most hassle-free applications to have installed. 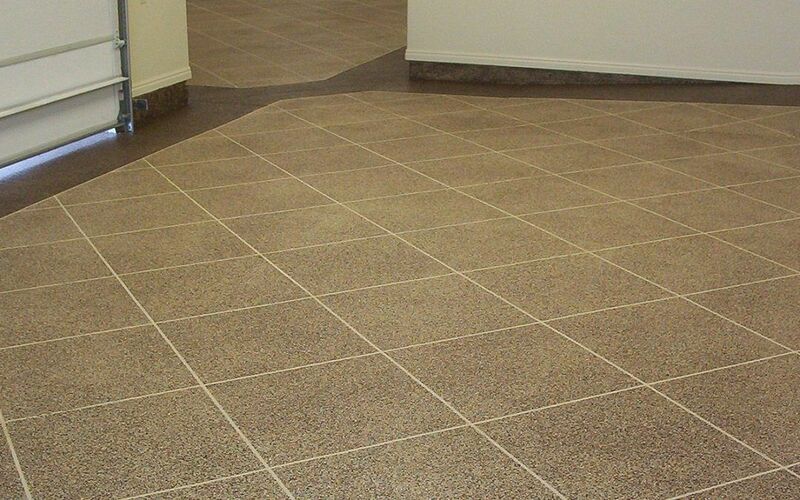 Self-leveling resin applications are most likely the type of flooring that you will see used in most buildings. Although it’s called self-leveling, that just means that it doesn’t require the installer to sand or smooth it mechanically. In many instances, the company handling your job can apply it directly onto any concrete surface. However, it’s important to understand that, if you attempt the installation by yourself, your site must begin even. If your concrete surface is deformed or higher on one side than the other, you’re going to see problems immediately. At a minimum, you’ll have floors that have a higher resin buildup that other areas, as well as possibly developing imperfections and cracking. Self-leveling resin is more expensive than two-coat roller applications, making cost a consideration before applying it throughout your home. However, it does tend to lead to faster installations since there are no texturing methods required. Unless you enjoy their appearance, or you have heavy machinery or furniture kicking around, you might not need to go for the superior durability of epoxy mortar floors. That said, they will likely outlast anything else in your home, and they require little maintenance at all. 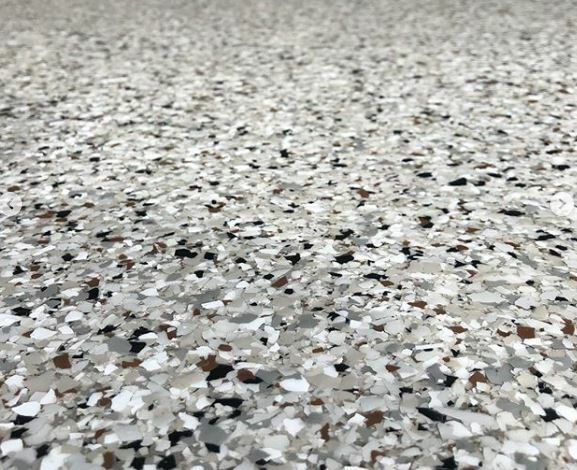 These floors combine epoxy resin with powdered concrete or other materials to create a surface that remains impact, stain, and chemical resistant. Although you’ll likely see these in more industrial applications, many commercial kitchens swear by them. If you find yourself to remain a particularly clumsy cook, the denser flooring type might be a better solution. If these floors can withstand daily forklift use, they won’t bat an eye at spilled boiling water or kitchen knives falling blade side down. Best of all, you probably won’t have to worry about moving furniture or appliances damaging your floors. Tile and hardwood quickly crack under the weight and easily scuff, but epoxy flooring can take a beating. 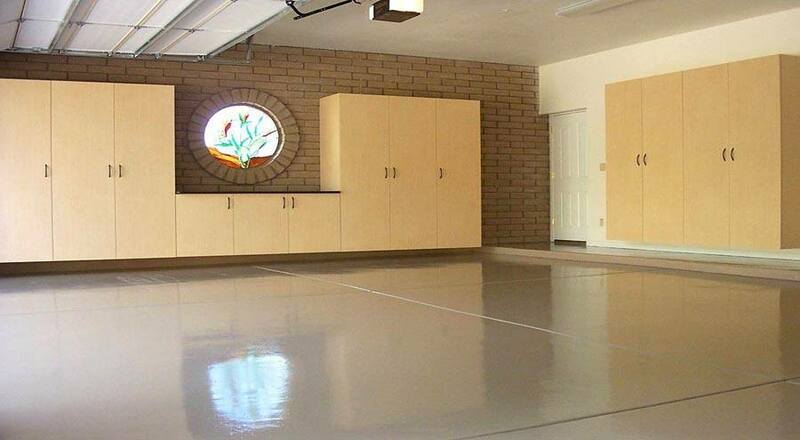 Self-dispersing floor systems are relatively similar to self-leveling epoxy floors. The primary difference is that, unlike self-leveling, self-dispersing resin coats incorporate quartz sand. Although it may sound like an odd addition to your chemical’s mix, the quartz sand serves a purpose. While some resin floors wind up becoming slick, the added sand makes these coatings naturally resistant to slips and falls. All resin flooring helps to make cleaning up spilled liquid easier because the mess remains on top of the surface rather than seeping down into it. However, in traditional epoxy coatings, that means a significant slip hazard every day. If you have children and pets, or already have mobility concerns, then you may want to choose the resin that promotes safer daily use. It offers all the same benefits of traditional epoxy while creating fewer hazards and potential for injuries. Many homeowners think that, if they go for an epoxy floor installation, that their house is going to wind up looking like an automotive repair shop. However, they might not understand that there are many ways of customizing how their resin coatings appear, including colors, textures, and other options. Terrazzo uses pieces of stone, marble, glass, or other natural materials to create a stunning shiny appearance with decorative flakes. Even if you haven’t seen this application used on floors, you have probably discovered it for counter tops in kitchens and bathrooms. Flaked epoxy, on the other hand, are mostly decorative in appearance, although they do create a rougher, more slip resistant surface than traditional resin floors. These flakes are often different colors, used to create custom patterns. Both Terrazzo and flaked epoxy floors can add that necessary textured look that doesn’t appear as industrial. When you use a talented installation team, they can help you achieve faux finishes that mimic other materials as well. Gravel takes the applications of Terrazzo and flaked floors to the next level with a more natural faux stone appearance. Gravel resin coatings are ideal for those who want the benefits of epoxy without it looking too commercial. By mixing gravel with the epoxy, it creates a stone appearance with the same glossy finish you prefer. Best of all, the process uses sand to bind the two textures, promote an earthier finished result. The application isn’t much different from other epoxy flooring installs, but it does take an experienced eye to get it right. As it is highly decorative, one mistake can ruin the overall look and feel. No matter which system is right, Dallas Epoxy Pros remains ready for your call.